As pioneers in the world of technology, it is time to face the bittersweet reality that the Cloud is no longer an innovative industry. In fact, in the next two years, Cloud adoption will mature and become a majority. According to 451 Research’s 2016 Voice of the Enterprise report, a majority of all workloads are expected to run in the Cloud within the next two years and more than a quarter will be public. The report predicts that the huge growth of Public Cloud will primarily come from conservative industries. This increase in Cloud adoption means that non-Cloud usage will drop below the majority for all workloads other than shared IT. This creates an enormous opportunity for Cloud service providers, but only if you tread carefully into these new markets, and present yourself correctly to those fearful of the risk of adopting Cloud computing. 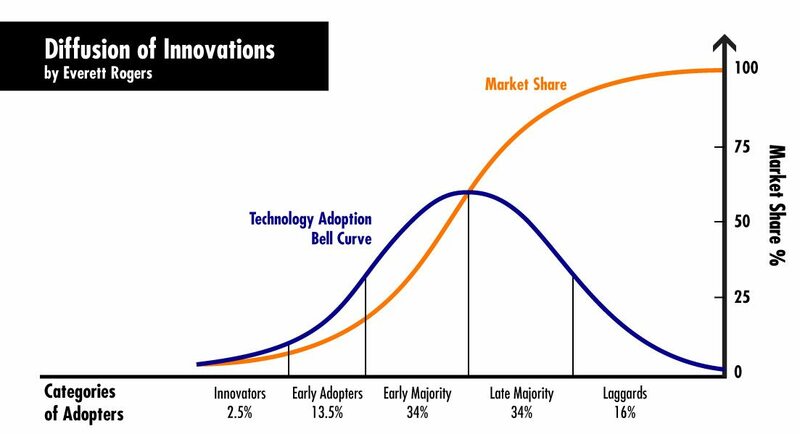 Let’s take a look at the Diffusion of Innovation bell curve, in which the population is graphed and divided into segments based on their statistical likelihood to adopt a new innovation. At the forefront of the curve are the innovators and early adopters, and at the end of the curve are the late majority and laggards. Those that fall within the tail end of the bell curve are the last to adopt a new technology and are risk-averse. In the disruptive IT realm, they can be a difficult sell. However, the time is now for Cloud service providers to capitalize on this segment of the market. But how? Put simply, by educating them to change their beliefs about the risk of adopting Cloud computing. Most importantly, make it clear to these prospects that the biggest risk actually lies in not moving their business to the Cloud. The most common objections held by the late majority and laggards fall into three distinct categories: conservative industries, those who are price sensitive, and traditionalists who are reluctant to change. Cloud service providers who will be successful in winning this new share of the market will know exactly how to educate risk-averse customers in order to convert them. For that reason, we’ve put together a helpful overview of key points to overcome the common ‘risks of adopting Cloud computing’ believed to exist by organizations that fall within the late majority and laggards. Conservative industries are by nature, risk averse. There is no question that when innovations enter the market, companies in conservative industries will be waiting patiently on the sidelines until the new technology is tried and tested by other, more adventurous organizations. And really, can you blame them? Conservative industries have hefty compliance regulations and acute security concerns that are difficult to migrate over to new systems and integrate into new procedures. Which means there isn’t much room for trial and error decision making. For that reason, safety and assurance are key to winning their business. MSPs and VARs targeting regulated sectors – particularly in financial services and healthcare – need to provide peace of mind to potential customers. Specialize in dealing with their sensitive data and expertise, beyond what other MSPs can provide. Explain how you can store their data in environments that are much more secure than what they can provide themselves, by utilizing offsite data centers and data encryption. Offer in-depth expertise that alleviates any sense of the risk of adopting Cloud computing for their business. In summary: Select a niche conservative vertical, get to know them inside and out, then tailor your services to their specific needs. This will remove any hesitation they may have about your ability to fulfill the intricacies of their needs and requirements. Every market has to struggle with price sensitive customers, and the answer to overcoming their price-related hesitance is pretty straightforward. Focus on value, not price. Many Cloud service providers make the mistake of failing to educate their market on the value they are getting for the price they pay. Chances are, a price sensitive customer has likely been burned by a provider in the past and is not interested in rolling the dice again. With warranted skepticism, you need to help them evaluate the cost savings they may not be accounting for in their assessment of your price tag. Help them to understand the high costs and significant risks of not adopting Cloud computing. Moving to the Cloud will prevent costly expenses and unnecessary IT spend. Costly losses of electronic records – customer information, financial records, project plans – can result in dire straits for their business. In fact, only 6% of businesses who suffer a major data loss are able to recover well enough to survive after the incident. Now, that’s a tough statistic to swallow. Working with the Cloud enables protection against catastrophes, physical disasters, and unpreventable accidents. Show your customers how the Cloud offers business continuity insurance. Let them know how working with an MSP’s specialized IT team, they can take advantage of sophisticated data backup and disaster recovery plans, can ensure their data is safe, all their systems perform optimally, and they minimize downtime outages. Educate your price sensitive prospect on how moving their business to the Cloud can decrease their current IT spend. Explain how hiring a Cloud service provider to manage their IT is less expensive than paying for in-house staff. MSPs offer customers consistent and predictable billing rates that alleviate the need to pay for unexpected and expensive repairs when something fails or breaks (since the costs of a managed service provider are inclusive). Finally, as the icing on the cake, offer to review their last year’s spend on IT with them and identify where Cloud services could have significantly cut down their costs. In summary: Show your potential customer how you can help them save money in the long run. By helping your price sensitive prospect understand the added value of moving to the Cloud, not only will you overcome their objection, but you can also earn their trust and long-term business. Lastly, some companies may not be in a conservative industry and have no fear of spending money, but plainly are not interested in a change of any sort. These organizations usually have a long history and a number of complex systems that they have been relying on for years without fail. In other words, ‘if it ain’t broke, why fix it?’ Well, to compete in today’s business landscape, and to not only survive but thrive, you need to be able to get out of your comfort zone. Successful organizations understand the importance of adapting to change and keeping up with market demands. As for the implications of not keeping up with change? Well, failure to stay ahead of the curve makes it easier for competitors to steal your customers and ultimately cause your business to implode. Let’s take a look at a well-known example of a company that failed to keep up with the times, Blackberry. Back in the early 2000’s Blackberry was dominating the smartphone market and users around the globe had fallen in love with their BBM messenger and efficient UX. With their overwhelming success, in 2009 Blackberry was named by Fortune magazine as the fastest growing company in the world. But, these days Blackberry is now only a distant memory – what went wrong? The hard and fast explanation: The company simply failed to innovate and adapt. When Google and Apple started to evolve their product offerings, Blackberry sat back and watched. Blackberry was so keen on sticking to their founding concepts that they ignored new market opportunities and consumer desires, as a result, they still have not found a way to recover from their losses. A classic case of a traditionalist failing to adapt and change. Focus on storytelling, rather than explaining features and benefits. Tell a personal story of your company that can be tied into the traditionalists narrative. This persuasion tactic will help you earn their buy-in by painting a picture that they are not just buying your service. Instead, it will allow you to build an emotional rapport that is the foundation of a long-term, trust-based relationship that they desire. Use case studies and leverage customer testimonials. Traditionalists are more likely to change their minds if they realize they’re not the first ones to change. Prove your value by showing them how you’ve helped other organizations similar theirs realize success from migrating to the Cloud. Create simulations of their business in the Cloud. Get to know their organization, then give them customized real-life examples with evidence of how Cloud computing will offer a cheaper and easier way to complete an increasing number of tasks. Whichever way you slice it, the Cloud is the future. Refusal to adapt will inevitably be their demise. That said, make sure you choose your words carefully when you lay it straight for them – there is an art to giving client’s negative feedback. In summary: To help motivate organizations reluctant to migrate to the Cloud, coordinate your multi-channel sales and marketing message to convey that you understand their pains and can offer a solution. Show them that once they adopt the Cloud, they will experience an entirely new and more effective way of doing business. There you have it: the Cloud is no longer the future – the Cloud is now. It is an exciting time for all Cloud service providers as well as their customers. As you embark into these new territories, take the time to get to know your market and offer insight to those new to the Cloud to ease their transition and help them overcome the risk of adopting Cloud computing. Being an educator in the space will not only earn your company authority and trust, but will ultimately help you earn more business. At Total Product Marketing, we specialize in market technology for Cloud service providers. Let us help you build a marketing strategy to capture emerging markets. Strike while the iron is hot by getting in touch with us today!